For those of us that have furry kids, preparing a meal – heck, even making a sandwich- feels like someone put up a sign that says, “Kitchen help wanted,” and our canine companions never fail to answer such ad. Look at the attention they are paying Cynthia. Cynthia moved to get something from the fridge, and her two helpers quickly moved into place to “guard” our food. Abby seems to be the more serious out of the two, don’t you think? I don’t know, but perhaps Roxie started to smell like something Cynthia was cooking because Abby took a lot of interest in Roxie’s face and ear. It’s always fun to see what our furry kids do when we are cooking. They certainly make life more interesting. 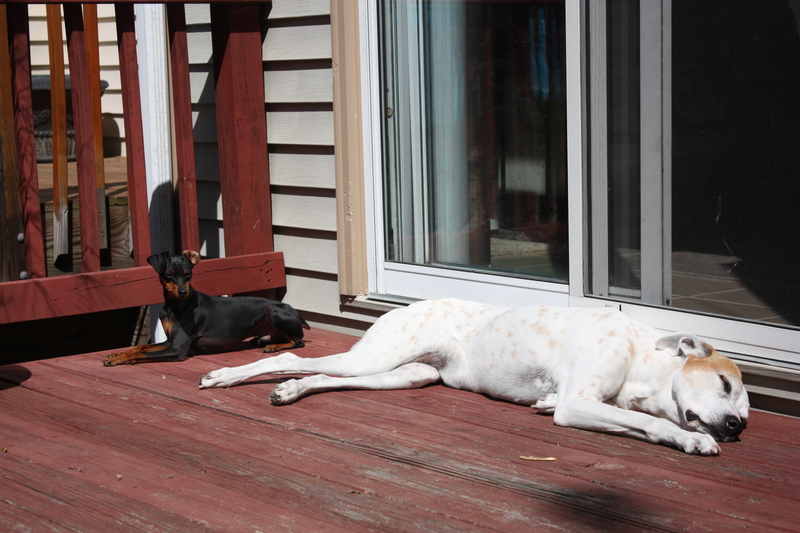 Guard Dogs Sleeping On The Job? 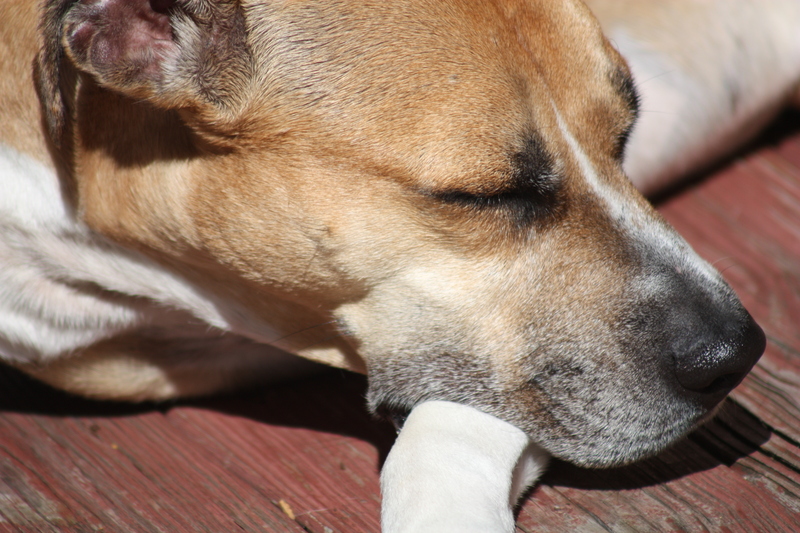 After our morning walk, Alex, a pit bull/Dogo Argentine mix, and Dexter, a boxer mix, were brushed and wiped, and because the weather was so nice we stayed hanging out on the deck for a little while. I like to brush them and wipe them after our walk not only because I like my house and dogs clean, but also because it relaxes them as you can see in the above picture. 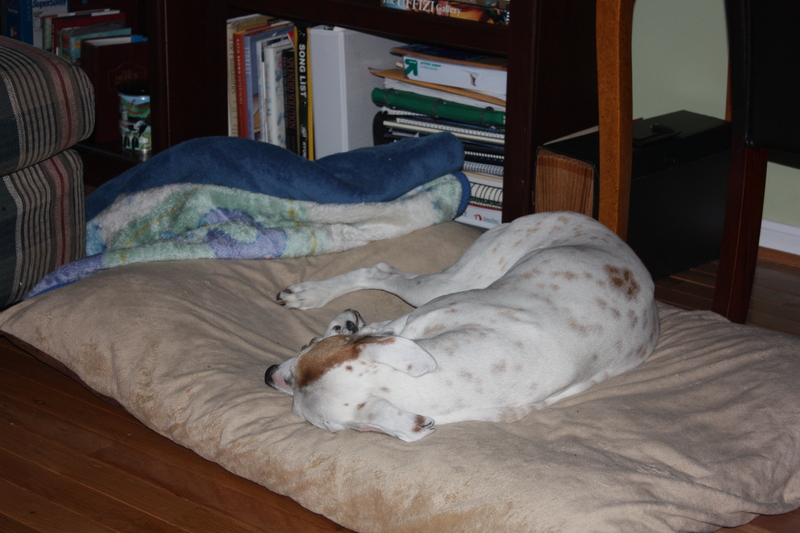 If they were guard dogs, check out Alex already asleep, my girl would have been the first one to be fired. But, they are not guard dogs, but rather part of our family and for many of us our canine children. I did have high hopes for Dexter since he was the only one awake, but within minutes, though honestly speaking I think it was seconds, he was out like a light just like my girl, Alex. 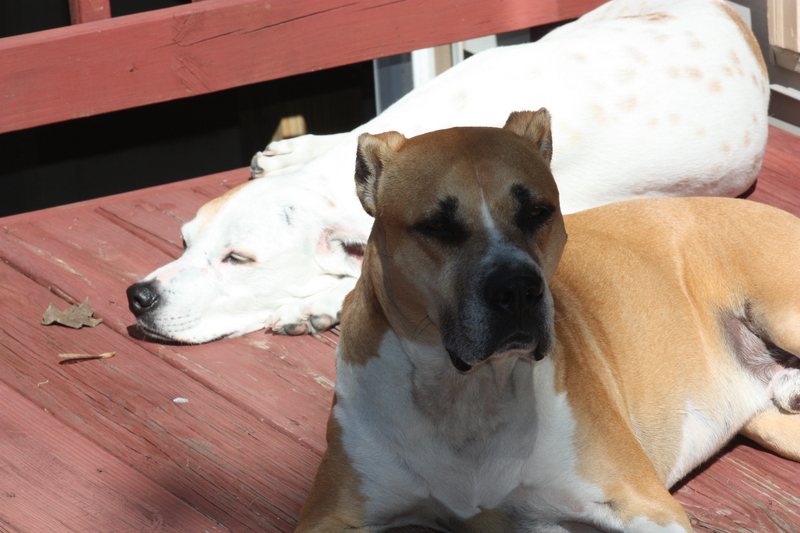 These two beautiful specimens are the perfect example of what guard dogs should not be doing: sleeping on the job. Right after we got back from our walk this morning, Alex, Gir, and Ellie, not featured in the above picture, decided to relax while Cynthia cooked us breakfast. 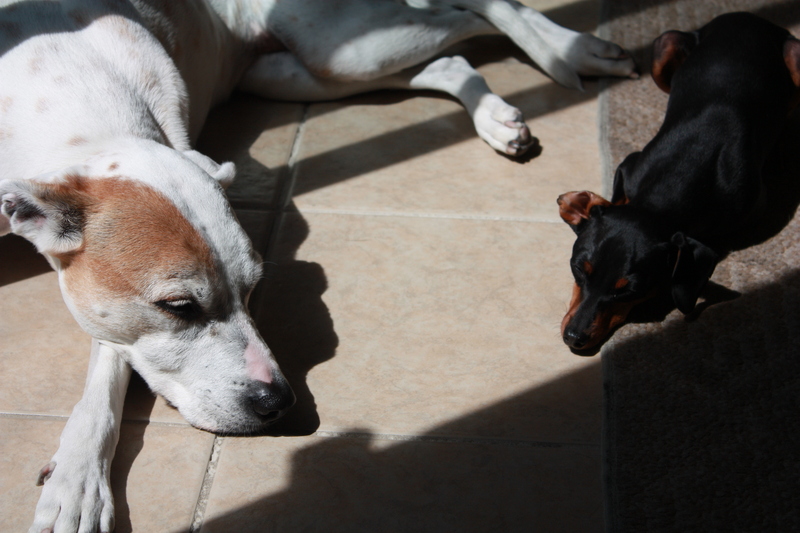 Alex and Gir love to sunbathe as you can see here. 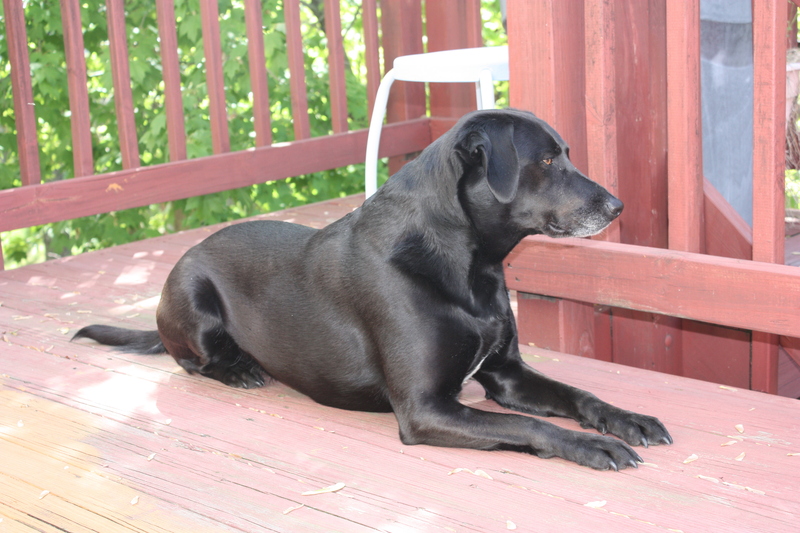 Ellie, on the other hand, preferred to be away from the sun since she is a black Labrador. 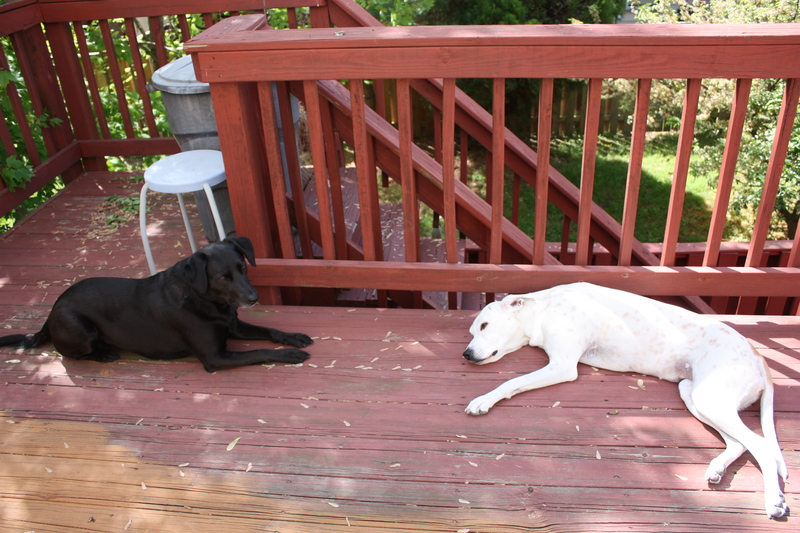 Right after breakfast, I took all of them out on the deck to relax for a bit. Ellie, being that this is her first time with us, was very curious about our deck and explored, sniffed, and looked at everything she found on it. After that, she decided to act as a guard dog, although I told her that there was no need for this is a very quiet place, but she insisted and now I know why. Alex and Gir were about to take a nap and someone had to be on guard, right? Let me rephrase that, Alex was asleep and Gir was on its way to dream land as well. Alex decided to move to the shaded area to continue her nap while Ellie, being the only responsible one of the bunch, continued to guard our home. Where is Gir? Falling asleep again. No wonder Ellie had to be awake. 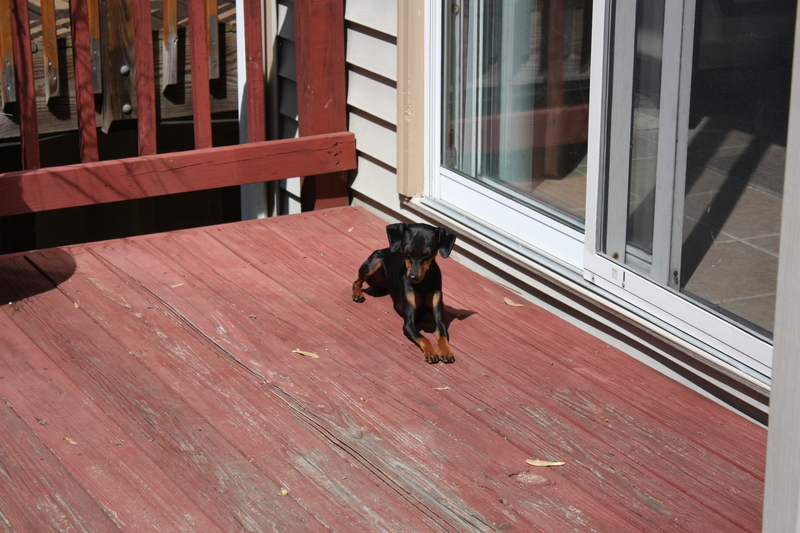 The weather was beautiful this Saturday morning so spending some time on the deck was quite enjoyable. Once we came in, they got some water and each one found their place or bed and took a nap. Alex, enjoying a well deserved nap. I envy her. I have very sensitive ears and even though I am asleep I can hear almost everything that is going on around me. But look at Alex. She is out like a light. 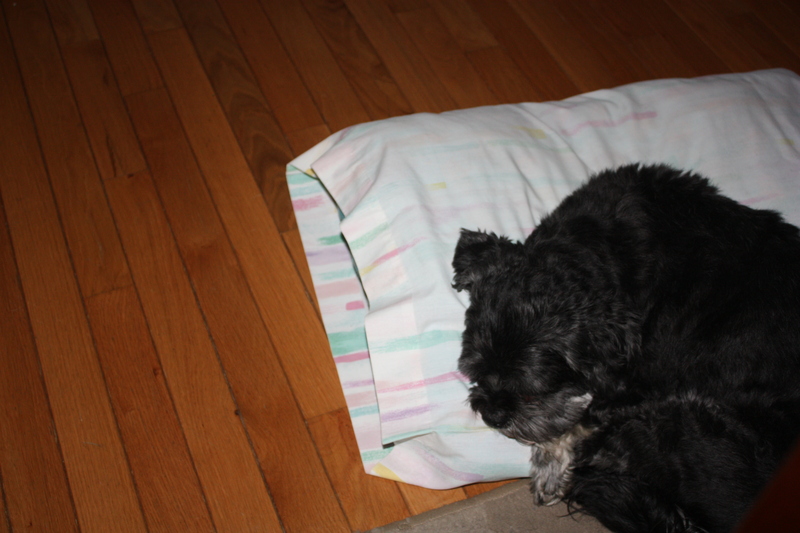 Oliver, a Lhasa Apso, is our guard dog. He is the first one to bark when he hears something going on around the house. 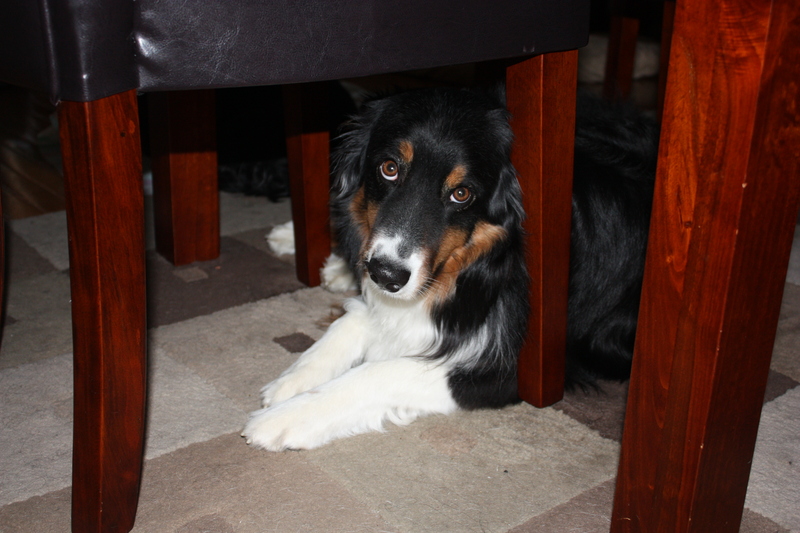 Walter, an Aussie, was the only one awake, but within 5 minutes he was also out like a light. Enjoy this beautiful Sunday afternoon with your loved ones.